Background: Acute pulmonary embolism (PE) is a life-threatening and a relatively common cardiovascular pathology. Although the pathogenesis of PE is well defined, there is no ideal diagnostic biochemical marker. Previous studies showed an increased ischemia modified albumin (IMA) levels in acute PE; however, the relationship between IMA and right ventricular (RV) dysfunction has not been examined. The aim of this study was to evaluate the diagnostic value of IMA and the relationship with RV dysfunction in acute PE. Materials and Methods : A total of 145 patients (70 females) with suspected acute PE was enrolled to the study. Eighty-nine patients were diagnosed with acute PE via computed tomographic pulmonary angiography. Sixty-five patients with similar demographic and clinical characteristics were assigned to the control group. All patients were evaluated for RV dysfunction using transthoracic echocardiography. Results: Serum IMA levels were significantly increased in acute PE compared with control group (0.41 ± 0.06 vs. 0.34 ± 0.11, P = 0.001). There was no relationship between serum IMA levels and RV dysfunction. IMA levels were positively correlated with shock index and heart rate. Receiver operating curve analysis demonstrated that serum IMA levels higher than 0.4 put the diagnosis at sensitivity of 53.85% and at specificity of 85.96%. Conclusions: Although IMA levels are increased in patients with acute PE, it failed to predict RV dysfunction. IMA is a biomarker, which is formed as a consequence of the modification of albumin by reactive oxygen radicals. Serum IMA levels are found to be increased in acute coronary syndromes, stroke, PE, mesenteric ischemia, and during percutaneous coronary interventions. ,,,,,, Previous studies demonstrated that IMA is more sensitive parameter than D-dimer in diagnosis acute PE. In addition, Türedi et al. showed that serum IMA levels are not correlated with pulmonary artery obstruction index (PAOI), which is measured with pulmonary CTA. However the relationship between IMA and RV dysfunction has not been examined. The aim of this study was to evaluate the diagnostic value of IMA and the relationship with RV dysfunction in acute PE. This is noninterventional and single-center study, which involved 145 patients with acute PE according to the European Heart Association 2008 Acute PE Diagnosis and Treatment Guidelines, who were admitted to Necmettin Erbakan University, Meram School of Medicine, Department of Cardiology, coronary intensive care unit, between February 2010 and March 2012. In order to confirm the diagnosis pulmonary CTA (Siemens Somatom-Sensation 64 CT scanner) was performed. Compliance of the study with the rules of the Helsinki declaration was approved by the Ethics Committee of Meram School of Medicine. All patients were informed about the study, and consent was obtained from all patients. Patients with known atrial fibrillation, peripheral arterial disease, acute stroke, acute coronary syndrome, decompensated heart failure, history of percutaneous coronary intervention or bypass surgery within the last 1 month and poor echocardiographic image quality were excluded from the study. Nevertheless, patients with massive PE (high-risk) were not included to the study. All patients were evaluated with a Philips EnVisor C HD ultrasound machine (Royal Philips Electronics, Bothell, WA, USA) with a 2.5 MHz transducer. The echocardiographic examination was performed at the left decubitus position and at the end of expirium. The measurements were recorded as the average of three consecutive heart beats. RV ejection fraction was measured from the apical four-chamber window by Simpson's method. Estimated systolic pulmonary artery pressure was measured with Bernoulli equation using a peak flow which was acquired by placing continuous wave Doppler to tricuspid valve regurgitation flow jet. RV systolic motion (RV Sm) was measured from the lateral tricuspid annulus via tissue Doppler imaging. Patients with RV/left ventricular (LV) >1 were defined as RV dysfunction. Blood samples of 5 cc were drawn from all patients upon the admission. Serum samples were immediately frozen and stored at −80°C for IMA. IMA was measured by enzyme-linked immunosorbent assay (ELISA) method (Human Ischemia Modified Albumin, IMA ELISA Kit). Samples were prepared at room temperature and diluted with 1/200 phosphate tampon. Reactives were fixed as wash buffer ve standard, serial dilutions were applied. All specimens were measured using a spectrophotometer at 450 nm (Shimadzu, UV 1601, Japan) and reported in absorbance units (ABSUs). All statistical analysis was performed using the SPSS for Windows (v. 15.0, SPSS Inc., Chicago, IL, USA). Results were presented as a mean ± standard deviation. The Kolmogorov Smirnov test was used to assess whether the data had a normal distribution (parametric or nonparametric). For normally distributed variables, a Student's t-test was used to compare groups with independent variables. Mann-Whitney U-test was used to evaluate nonparametric data. A linear Spearman test was used to explore the relationship between IMA and both clinical and echocardiographic parameters. MedCalc (version 9.2.0.1., MedCalc Software, Belgium) pocket program was used to obtain receiver operating curve and to analyze specificity, sensitivity, negative and positive predictive values of IMA in diagnosis acute PE. A P < 0.05 was considered statistically significant. Demographic, clinical, and laboratory characteristics of patients with acute PE and control groups are depicted in [Table 1]. There was a significant difference between groups in terms of body mass index, heart rate, systolic blood pressure, and shock index [Table 1]. 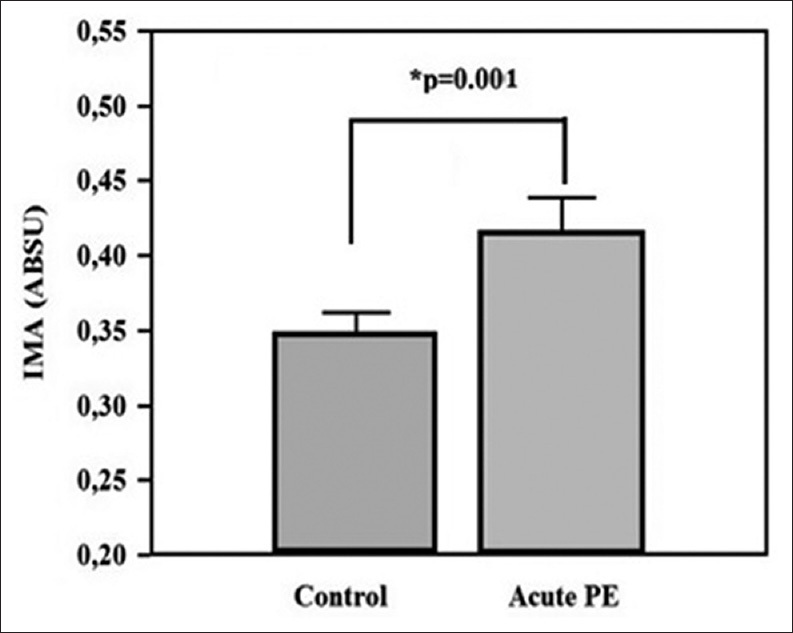 Serum IMA levels were increased in patients with acute PE compared to control group (0.41 ± 0.06 vs. 0.34 ± 0.11 P = 0.001) [Figure 1]. Of the laboratory parameters, serum creatinine levels, hemoglobin, and white blood cells were elevated in patients with acute PE compared to controls [Table 1]. From the cardiac biomarkers, troponine levels were significantly increased in acute PE patients (0.28 ± 0.40 ng/ml vs. 0.08 ± 0.10 ng/ml, P= 0.02) RV functions were evaluated in both groups. There were 46 patients with RV dysfunction in acute PE patients (46 of 89, 51.6%). Estimated pulmonary systolic blood pressure (PABs) was significantly higher in acute PE patients compared to control group (44.7 ± 16.6 mmHg vs. 27.1 ± 6.2 mmHg, P = 0.001). RV Sm was significantly lower in acute PE patients (12.7 ± 2.3 cm/s vs. 14.9 ± 2.7 cm/s, P = 0.001). 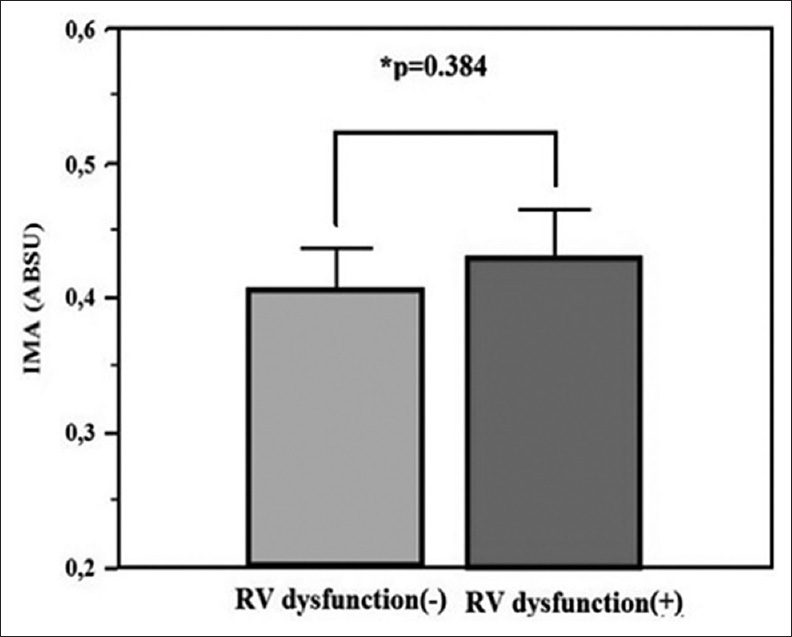 Serum IMA levels were similar between patients with and without RV dysfunction (0.42 ± 0.12 vs. 0.40 ± 0.11, P = 0.38) [Figure 2]. Heart rate and shock index were significantly increased in patients with RV dysfunction (106 ± 16 bpm vs. 95 ± 19 bpm, P = 0.01 and 0.94 ± 0.22 vs. 0.65 ± 0.09, P = 0.01, respectively) [Table 2]. 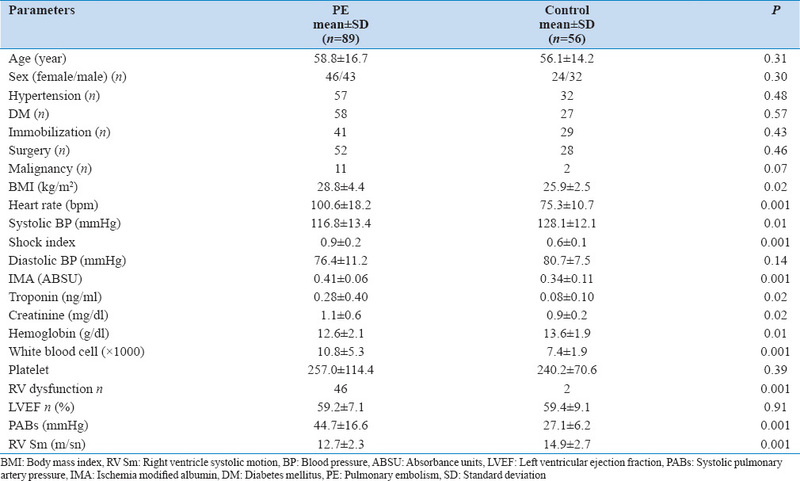 From the echocardiographic parameters, estimated PABs was significantly elevated in patients with acute PE and RV Sm was decreased in patients with acute PE [Table 2]. There was significant correlation between serum IMA levels and both shock index and heart rate ( r: 0.36, P = 0.02 and r: 0.31, P = 0.001, respectively). Serum IMA levels above 0.4 ABSU value had sensitivity, specificity, positive predictive value, and negative predictive value of 53.85%, 85.96%, 86%, and 53.8%, respectively (area under the curve = 0.720 [95% CI: 0.641-0.791] P = 0.001) [Figure 3]. In this study, we found that serum IMA levels are increased in patients with acute PE. In addition, there was not correlation between IMA and RV dysfunction. IMA levels were significantly correlated with shock index and heart rate. 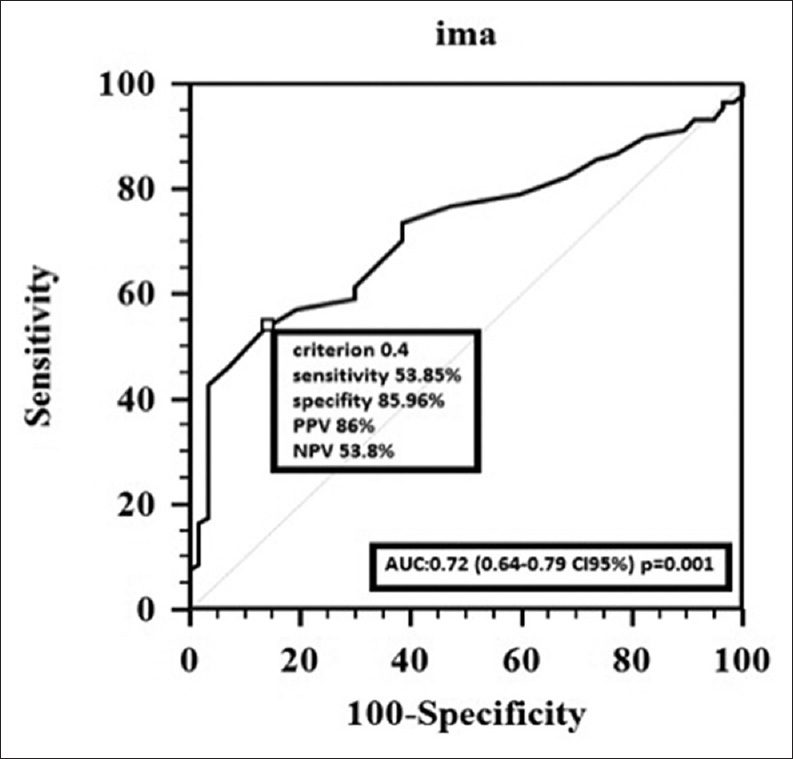 Nevertheless, IMA >0.4 ABSU had higher positive predictive value in diagnosis acute PE. Serum IMA levels may be used as a nonspecific biomarker of tissue ischemia. Türedi et al. found that serum IMA levels are elevated in patients with acute PE and have higher positive predictive value compared to D-dimer in diagnosis acute PE. However, serum IMA levels alone were not sufficient in diagnosis acute PE and additional diagnostic tests are required. Nevertheless, in another study performed by Türedi et al., serum IMA levels were not correlated with PAOI and RV/LV ratio measured with pulmonary CTA. Previous studies showed that approximately 40% of patients with acute PE have RV dysfunction and presence of RV dysfunction is related with adverse clinical events and in-hospital mortality. , In our study, 52% of patients had RV dysfunction. We also found that serum IMA levels are not correlated with RV dysfunction. In addition, IMA >0.4 ABSU has higher positive predictive value, and additional tests are also needed. Increased levels of serum IMA may be explained with hypoxia and tissue ischemia. Serum IMA levels were correlated with shock index and heart rate, and this correlation may be also explained with tissue ischemia as a cause of hypotension and hypoperfusion. Several limitations need to be mentioned in this study. The main limitation in this study is a lack of power analysis to detect sample size in different groups. In addition, the fact that it is nonrandomized study is another limitation. We did not assess the short and long-term prognosis between IMA and acute PE. Serum IMA levels have higher positive predictive value and may be used as an additional diagnostic tool in patients with acute PE. However, serum IMA levels were not correlated with RV dysfunction measured with echocardiography that is an important parameter of severity patients with acute PE. Ng AC, Chung T, Yong AS, Wong HS, Chow V, Celermajer DS, et al. Long-term cardiovascular and noncardiovascular mortality of 1023 patients with confirmed acute pulmonary embolism. Circ Cardiovasc Qual Outcomes 2011;4:122-8. Konstantinides S, Torbicki A. Management of venous thrombo-embolism: An update. Eur Heart J 2014;35:2855-863. Yayan J. Relative risk of pulmonary embolism in the very elderly compared with the elderly. Clin Interv Aging 2013;8:861-70. Weberová D, Weber P, Kubesová H, Meluzínová H, Polcarová V, Ambrosová P, et al. Occurrence of pulmonary embolism among 260 in-patients of acute geriatric department aged 65 years in 2005-2010. Adv Gerontol 2012;25:506-12. Torbicki A, Perrier A, Konstantinides S, Agnelli G, Galiè N, Pruszczyk P, et al. Guidelines on the diagnosis and management of acute pulmonary embolism: The Task Force for the Diagnosis and Management of Acute Pulmonary Embolism of the European Society of Cardiology (ESC). Eur Heart J 2008;29:2276-315. Becattini C, Vedovati MC, Agnelli G. Prognostic value of troponins in acute pulmonary embolism: A meta-analysis. Circulation 2007;116:427-33. Klok FA, Mos IC, Huisman MV. Brain-type natriuretic peptide levels in the prediction of adverse outcome in patients with pulmonary embolism: A systematic review and meta-analysis. Am J Respir Crit Care Med 2008;178:425-30. Türedi S, Karahan SC, Mentese A, Gündüz A, Topbas M, Kosucu P, et al. Investigation of relationship between the D-dimer and ischemia-modified albumin levels with the radiological imaging-based pulmonary embolism severity score in acute pulmonary embolism. Anadolu Kardiyol Derg 2010;10:346-52. Turedi S, Gunduz A, Mentese A, Topbas M, Karahan SC, Yeniocak S, et al. The value of ischemia-modified albumin compared with d-dimer in the diagnosis of pulmonary embolism. Respir Res 2008;9:49. Pavlidis AN, Kallistratos MS, Karamasis GV, Tsoukas AS, Levantakis IP, Mauropoulos D, et al. Diagnosis and risk stratification in acute pulmonary embolism: The role of echocardiography. Rev Cardiovasc Med 2013;14:56-65. Sbarouni E, Georgiadou P, Voudris V. Ischemia modified albumin changes-review and clinical implications. Clin Chem Lab Med 2011;49:177-84. Kehl DW, Iqbal N, Fard A, Kipper BA, De La Parra Landa A, Maisel AS. Biomarkers in acute myocardial injury. Transl Res 2012;159:252-64. Gaze DC. Ischemia modified albumin: A novel biomarker for the detection of cardiac ischemia. Drug Metab Pharmacokinet 2009;24:333-41. Gunduz A, Turedi S, Mentese A, Karahan SC, Hos G, Tatli O, et al. Ischemia-modified albumin in the diagnosis of acute mesenteric ischemia: A preliminary study. Am J Emerg Med 2008;26:202-5. Gunduz A, Turedi S, Mentese A, Altunayoglu V, Turan I, Karahan SC, et al. Ischemia-modified albumin levels in cerebrovascular accidents. Am J Emerg Med 2008;26:874-8. Ahn JH, Choi SC, Lee WG, Jung YS. The usefulness of albumin-adjusted ischemia-modified albumin index as early detecting marker for ischemic stroke. Neurol Sci 2011;32:133-8. Gurumurthy P, Borra SK, Yeruva RK, Victor D, Babu S, Cherian KM. Estimation of Ischemia Modified Albumin (IMA) Levels in Patients with Acute Coronary Syndrome. Indian J Clin Biochem 2014;29:367-71. Ertekin B, Kocak S, Defne Dundar Z, Girisgin S, Cander B, Gul M, et al. Diagnostic value of ischemia-modified albumin in acute coronary syndrome and acute ischemic stroke. Pak J Med Sci 2013;29:1003-7. Morici B. Diagnosis and management of acute pulmonary embolism. JAAPA 2014;27:18-22. Brown MD, Rowe BH, Reeves MJ, Bermingham JM, Goldhaber SZ. The accuracy of the enzyme-linked immunosorbent assay D-dimer test in the diagnosis of pulmonary embolism: A meta-analysis. Ann Emerg Med 2002;40:133-44. Brown MD, Lau J, Nelson RD, Kline JA. Turbidimetric D-dimer test in the diagnosis of pulmonary embolism: A metaanalysis. Clin Chem 2003;49:1846-53. Di Nisio M, Squizzato A, Rutjes AW, Büller HR, Zwinderman AH, Bossuyt PM. Diagnostic accuracy of D-dimer test for exclusion of venous thromboembolism: A systematic review. J Thromb Haemost 2007;5:296-304. Stein PD, Hull RD, Patel KC, Olson RE, Ghali WA, Brant R, et al. D-dimer for the exclusion of acute venous thrombosis and pulmonary embolism: A systematic review. Ann Intern Med 2004;140:589-602. Grifoni S, Olivotto I, Cecchini P, Pieralli F, Camaiti A, Santoro G, et al. Short-term clinical outcome of patients with acute pulmonary embolism, normal blood pressure, and echocardiographic right ventricular dysfunction. Circulation 2000;101:2817-22.